Hello! 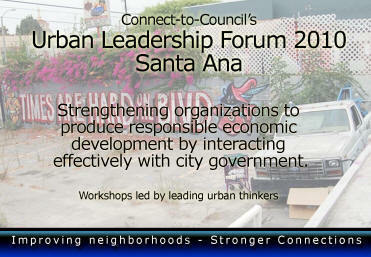 If you have not yet registered for the Santa Ana Urban Leadership Forum 2010, there is still time! Learn the skills that leaders absolutely need to bring about change in their communities within Santa Ana! 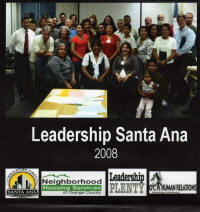 Make a difference by strengthening your organization and interacting more effectively with the City of Santa Ana! Register by calling (714) 567-5138, or click here. Please register by April 16, 2010. If you need further information, please call 714-745-1692. To increase neighborhood participation in civic affairs and empower representative leaders to have a greater voice in the decision making processes that affect their lives. To bring neighborhood and city government representatives together to actively communicate and strategize about shared concerns and opportunities. To develop a new civic infrastructure that empowers neighborhood association leaders to positively and constructively communicate with their elected officials to develop a foundation for innovative ways to deal with a variety of issues including economic development, housing affordability, foreclosures, redevelopment, gangs, safety concerns and violence. To develop more sustainable neighborhood leadership through an educational conference to help neighborhood representatives obtain a better understanding of our city structure, learn leadership strategies and community problem solving techniques.